They regularly meet twice a month on their own dime while taking the time to study agendas and backup materials. In addition, they may call special meetings, emergency meetings and workshops when necessary. The duties of a Pahrump Town Board member vary from day- o day. Board members spend some of their time fielding phone calls from irate residents who have concerns about any number of local issues. One board member said he gets calls from residents on everything from the condition of area roads to why the sheriff’s department is over budget. Interestingly, the latter two are not under the purview of the town board. That noted, last night’s town board agenda contained an item that can be described as a real head-scratcher to some. Consent agenda item “C” called for the approval of a 100-percent increase in compensation for all five board members. It should be known that town board members do not receive a cent for their work and never have. They do, however, get reimbursed for travel and other expenses incurred while conducting official town business. Board member Dr. Tom Waters addressed the agenda item this week. Waters noted that he had no problems with the item mainly because it is “budgeted”. “There’s just so many people in town who believe we get $20,000-to-$30,000 a year, but we don’t and like I said, a 100 percent increase in compensation for the entire board is already budgeted,” he said. 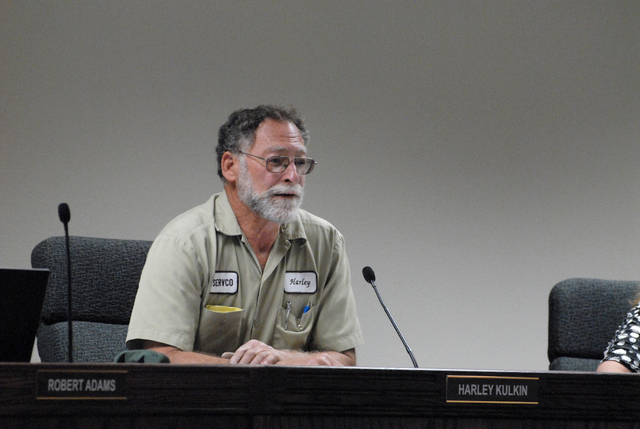 This week, Town Board Chair Harley Kulkin, who authored the agenda item, explained his reasoning for submitting it just in time for April Fools Day. “There are so many people in town that just don’t seem to know what’s going on so I thought I’d put that on there just to see how many people actually thought that we got paid. Obviously 100 percent of nothing is nothing. It’s an exercise in pointing out that people are not in touch with their community as much as they need to be,” he said. Town Manager Susan Holecheck, meanwhile, said she does believe that board members do deserve something for their efforts. “I know how much time is required to do an effective job on behalf of the town. Oftentimes you sit on many boards and you want to be available to your constituents. I truly believe that some kind of remuneration is appropriate. I am not in favor of huge salaries but I do know that this board works hard and they care about the people. It would be nice if they could be awarded something because they do put in a lot of time,” she said. The exact issue of “time” was also in front of the town board this week. Board members considered approving a change in the start time of town board meetings from 5 to 6 p.m.
Just recently the board approved changing the time from 7 p.m. to 5 p.m.
Holecheck said a few board members expressed in interest in altering the start for the sake of convenience. “We had a board member who still had difficulties with 5 p.m. I think another board member was trying to be somewhat accommodating but I still like the earlier start time. Both staff and I begin our day at 7 a.m., so honestly by 7:30 at night I get a little rummy. I really thought 5 p.m. was great,” she said. Results of last night’s board action will appear in Friday’s edition of the Pahrump Valley Times.